What is best, Working as a Self-Employed Individual or as a Company (S.L.) in Spain? You already have your idea. You have exactly defined which will be the sector. You also have the business model. You know how you are going to get clients. You know which will your competitive advantages be. And, especially, you are eager to start NOW. But before that, you must make an important decision. Which is the best option, self-employed or society? Should I constitute a business or start operating as a freelancer? In this article, we will analyze which is the best way to conduct your professional activity according to the legal point of view. There is nothing such a general answer to this question. If it is best to operate as a self-employed individual or to constitute a society (S.L.) will depend on your concrete situation. In this post, we will analyse all the aspects you should take into consideration when deciding which business structure is more appropriate for you. You will need to place all those factors on a scale, and see which side weighs more and is, therefore, more important. It will be your concrete situation and your preferences that will dictate which of them is heavier than the others. This, finally, will enable you to make a wise decision. Let’s start at the beginning: the moment in which you constitute your firm. If you start operating as a freelancer, there is no legal requirement that forces you to contribute a certain amount of money at the beginning. That means that the constitution process will be FREE. On the other side, forming a society has a certain amount of expenditures associated during the process, and we are not referring just to the contributed capital. At the moment of starting a company (let’s say, a Limited Liability Company), the Spanish regulation demands the contribution of 3.000€ in terms of social capital. This money, for sure, can be used for the daily activities of the firm. But the monetary outlay does not end up there. To constitute a company requires a series of additional procedures that are much more complex than those that would exist if we carried out our operations individually. And, obviously, all this has a cost. Well, surely you would want to hire a lawyer specialized in business issues to accompany you throughout the whole process (something we 100% recommend to avoid problems at an earlier stage). The self-employed or freelancer, on the other hand, has a much simpler life in these constitution procedures. With just the registration in the Social Security and Hacienda (with the 037 model, which can be issued electronically) will be sufficient. And at cost 0! Both the freelancer and the society will pay in terms of social security a certain amount each month. The main difference is the concrete amount we are talking about. And here is where we can find another big discrepancy. The self-employed will end up paying much less: if he or she can apply for the available bonifications, will end up paying a flat rate of 50€ per month during the first 6 (fulfilling the required conditions). During the next 6 months, she will enjoy a reduction in the tariff of 50%, which will be reduced to 30% for the following 6 months. All these percentages are applied to the minimum base. On the other hand, a society will need to incur in a bigger cash effort. 280€ per month during the first year. The debate surrounding equity and the responsibility involved is, without any doubt, one of the most relevant factors to consider. If we talk about business, risk will always be there. It plays a really important role in all companies, and we should get ahead of it. Knowing that we can lose our house if our firm doesn’t perform as expected can be an idea that determines our final decision regarding weather tho choose to constitute a company or to operate as a freelance. So, which is the main difference in this sense? We find here the first section among all those seen up till now in which being a self-employed would be worse. This responds with all its assets, present and future ones, in the event of possible losses arising from its activity. Business assets and personal assets are converted into equivalent terms. If it is an issue that we are particularly worried about and we do not want to assume that much risk, we will have to start a society. Why? Because with this business structure we will be protecting our own heritage: we will only respond with the social capital that we have contributed. If we are not willing to risk our properties or possessions in case the business does not go as expected, we must set up an S.L. If on the contrary we are risk lovers and this is not a factor that will withdraw sleep from you, probably operating as a self-employed person is a better option. However, in the financing section, we will see that the limitation of responsibility is not as direct and simple as it seems. Another relevant factor, that will demand an important investment in terms of time and effort, will be the accounting of the company. If we do not want to overcomplicate ourselves in this sense, we will then opt to function as a self-employed worker. Like this, we would just need to register issued and received invoices. Freelancers respond to basic accounting. On the flipside, once we have constituted our company (S.L. ), we will enter the tedious world of the Plan General Contable (The general accounting document in Spain). We would need to maintain complete accounting of our operations, with quarterly and even monthly declarations. This will not only steal our precious time but also, on many occasions, will mean a certain monetary cost. What we recommend in Balcells Group is that you outsource this type of activities. In the end, the businessman should focus on that what he does best: the core of his business activity. And, in many occasions, accounting requires the dedication of time that we could be devoting to attract new customers or providing more services (which is what really brings income to the table). Nevertheless, we should do our accounting. Which is then the best option? Letting a professional manage the accounting of your firm. We ourselves offer monthly accounting services both for self-employed individuals and for companies. Here comes another big issue. Taxes will, without any doubt, be a crucial determinant at the moment to make our decision: how much taxes are we going to pay as a society and how much taxes will we end up paying as freelancers do have a relevant weight. Inheritance tax. This is a tax paid once a year on the assets that you have registered in your business. For example, if you have 3 computers and 2 smartphones, you will pay taxes for having to those 5 items. Donations tax. It is a tax rate applied to heritage transfers that are produced by inheritance or by donation. If I, as an entrepreneur, die and all the business is transferred to my son, that transmission will be taxed by the ISD. VAT. The Value Added Tax is not a differential factor: both individual companies and Limited Liability Companies end up paying it. For example, when we submit an invoice (and depending on the type of service) a VAT rate will be applied or not. Corporate Tax (Impuesto de Sociedades). In this case, it is a flat tax rate of 25% on the profits the company makes. ITP. The Patrimonial Transfer Tax records the different transactions of corporate nature that occur during its life, such as capital increases, liquidation, mergers, divisions, etc. Once we understand the different types of taxes we will pay under one structure and under the other, we can assess the situation from a general perspective. As a general rule, we can affirm that if you expect few levels of earnings, the best alternative will be to establish yourself as autonomous. 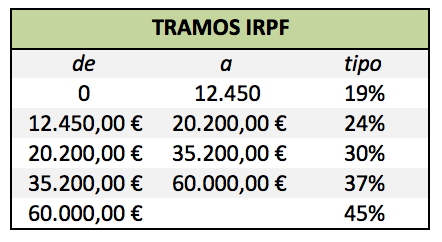 As the tax rate of the IRPF will not reach the fixed level of corporate tax. However, at higher levels of earnings, a society will be a better option, since a fixed rate of 25% will make the tax burden lower than if we were based on the progressive IRPF (which can reach 45%). Both at the moment in which we start our operations as well as at the point in which these start functioning successfully, accessing to bank financing is usually a good option. Well, accessing these monetary resources will not be as easy being an autonomo than if being a society. A limited liability company will have access to external capital in a much simpler way. The fact that a society is much more established and that above all the facts having an accounting that allows to clearly show the financial and patrimonial situation of the company (and thus its solvency) constitute guarantees that a freelancer entrepreneur can not offer. Therefore, if we expect to solicit external financing, a society will be the best path. However, we must relate this to the subject of the aforementioned responsibility. As we have said, starting a society means limiting your responsibility to the capital contributed. But we encounter a problem here. The bank, in order to grant you a loan, will ask for an endorsement. That is why, in case of being constituted as a company, you must contribute part of your personal assets to fulfil this function (because the company can not do it in this case, since we had only contributed the € 3,000 of initial capital). Therefore, the advantage of reducing your responsibilities by establishing a limited liability company is diluted if we want to request a loan. Let’s now think about the long term. And, what if the time comes when we want to expand our business? In that case, having a society is undoubtedly favoured. The fact of being architectured through participations makes the management of shareholders and capital expansions a much simpler task. SUMMARY: WHICH IS THE BEST OPTION, STARTING YOUR OPERATIONS AS A FREELANCER OS A SOCIETY? As we have been seeing throughout this post, there is no better option than another. 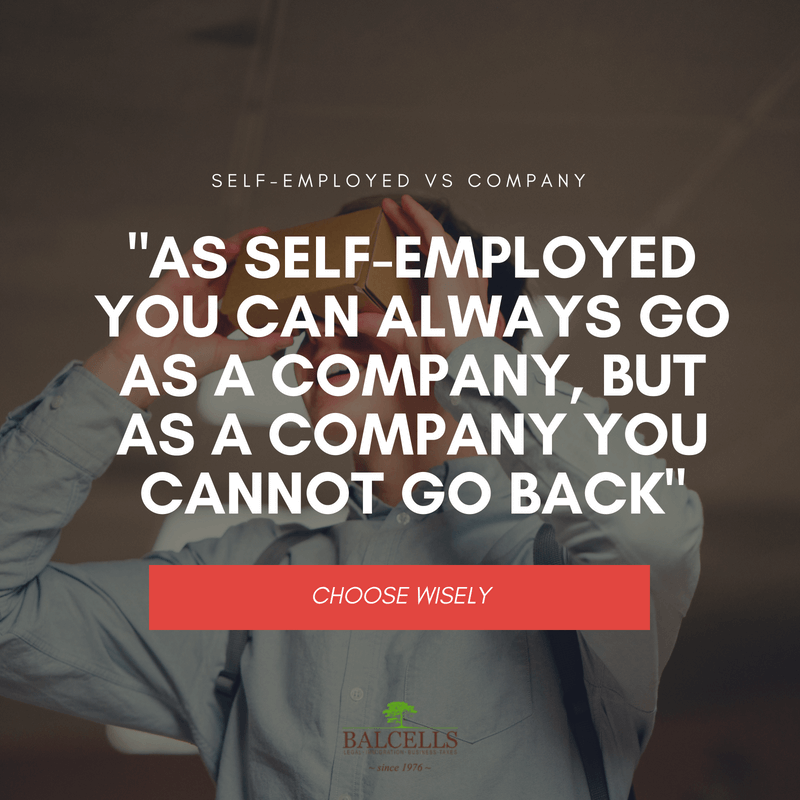 The decision to establish a company or to operate as a freelancer/self-employed worker will depend on our particular situation and the weight we give to each of the factors analyzed. However, the usual process usually begins with the entrepreneur operating as a self-employed person and making the transition into a society with the passage of time. Why is this sequence the natural thing to do? Well, “If you start as a freelancer you can always go as a society, whereas if you start as a society, you will not have the option to go back and become a freelancer”. As a final summary, we can say that because due to the ease in the constitution process, accounting simplicity and monetary outlays in social security, being a self-employed worker is a better option. If we focus on the limitation of responsibilities and protection of personal assets, bank financing and the expansion opportunities, setting up a company will be the option to choose. Now you know the most important factors you should consider in order to make your decision. Let us help you! Request an appointment with our lawyers specialized in company constitutions (in person at our offices or via Skype), and we will help you decide which is the best corporate form for your activity. LET US ANSWER ALL YOUR QUESTIONS HERE!